Celebrating Enterprise 2018 Awards, Houses of Parliament, Westminster – Nominations are now open! Celebrating Enterprise 2018 Awards event. Celebrating Enterprise is our annual awards event celebrating those that are excelling in enterprise learning and skills and bringing together key players from the enterprise skills sector in the UK. The awards recognise enterprising excellence in a range of settings, from new start businesses, to innovative learning centres, enterprising employees to international business success, we show how enterprising excellence can be found at all levels and in doing so show how investing in skills can achieve outstanding results. Our Celebratory Event will take place on Wednesday 2 May in the Houses of Parliament, Westminster, overlooking the River Thames, an enjoyable and prestigious venue for the event. Nominations are now open with the closing date being Thursday 1 March 2018. We would like to welcome nominations from our network and the wider enterprise community. All nominations will be considered by the panel of expert judges with shortlisted nominees notified by April 2018. Each of the shortlisted nominees, along with a guest, will be invited to attend the Awards event. 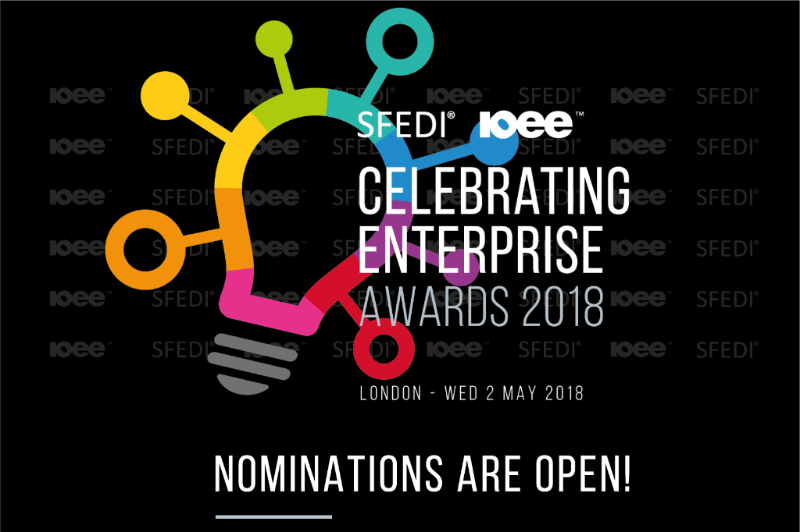 For further information on the event, nomination criteria and to make a nomination or to nominate yourself, please visit celebratingenterprise.com. We have a range of event sponsorship packages for the Celebrating Enterprise Awards event. These sponsorship packages are designed to achieve unique opportunities for sponsors to engage with SFEDI and the IOEE’s partners and guests and both organisation’s wider networks. We aim to work in collaboration with sponsors to create a programme of activity that works well for both the events and the sponsoring organisation. For further information on sponsorship, please contact the IOEE team on 0845 467 4928 or visit celebratingenterprise.com to download our sponsorship pack.